Preventative Care | Animal Medical Center Rogers, AR. At Animal Medical Center, we emphasize the importance of preventing parasites. Through preventative measures, you can successfully protect your pet. But pets that are not protected often develop parasites, leading to serious problems for them and their owners. The cost of prevention is minimal compared to the cost of treatment, which can be expensive and stressful on your pet. Parasites like heartworm can even be fatal, so preventing parasites is of the utmost importance. We recommend Interceptor Plus and Sentinel Spectrum, be sure to ask us which product would work best for your pet. Interceptor Plus is a monthly chew used to prevent against heart worm and intestinal worms. Price may vary depending on weight. Sentinel Spectrum is a monthly chew used to prevent against heart worms, intestinal worms and FLEAS! Revolution is a once monthly topical application for flea/tick chew used for flea, mite, heart worms and intestinal worms. We have a new heartworm prevention we are offering! The name of the prevention is “Pro Heart 6”, and it is very safe, and very convenient. Some of you may be familiar with this prevention already. Remember, heart worms are spread through mosquitoes, and mosquitoes are still present this time of year. Receiving the prevention entails an injection given subcutaneously (under the skin) here in our clinic, and it is to be given every 6 months, but a yearly heartworm test is still required. 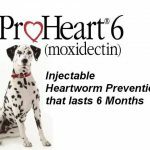 Most heartworm preventions are given in chew or tablet form once a month, but Pro Heart 6 is different in that you don’t have to worry about administering it every month, just every 6 months! We recommend starting the prevention on dogs 6 months of age or older. Bravecto is a very convenient flea/tick chew that you only have to give every three months!